One of the most common questions I am asked is “what brand of face paint is the best”? The hardest part about answering that question is that, in my 20 years experience with all the brands of face paint, there really isn’t a “best”. The main difference between the brands is color selection and consistency. For example, Paradise and FAB do not offer Neon/ UV colors, where as Tag, Global and Kryolan do. So, it would be hard to say Paradise is the overall best because when compared side by side with Kryolan they do not have the same colors to match up. So, I usually recommend first building your kit with the colors you enjoy using the most and ignoring the brand name. 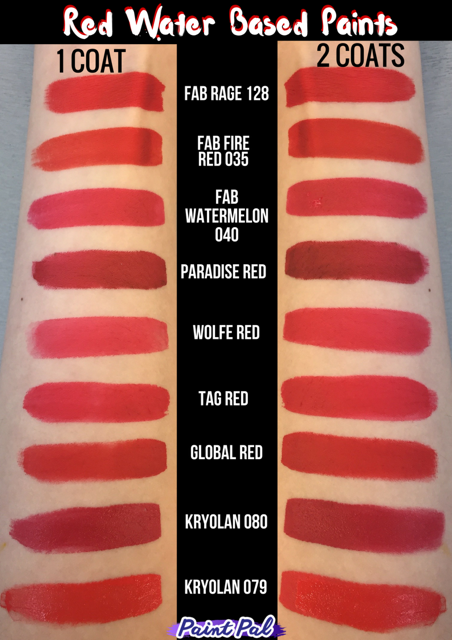 We can help you find the perfect red! Besides color selection, the distinguishable difference is the consistency of the make up. Tag, Wolfe, Global, Cameleon, and Kryvaline have a beeswax base- which means they are slightly stickier. They are known for their smooth texture, making them ideal for line work. But because they are stickier, they typically aren’t as easy to use for blending and layering colors. FAB, Kryolan, Paradise and Snazaroo are glycerin based paints. They are creamy to the touch and creamy in consistency. They are well known for their blending and layering ability and painters find them easy to work with. Glycerin and wax based face paints can be used simultaneously and work excellent together. Which is why the best kits are comprised of various different brands. 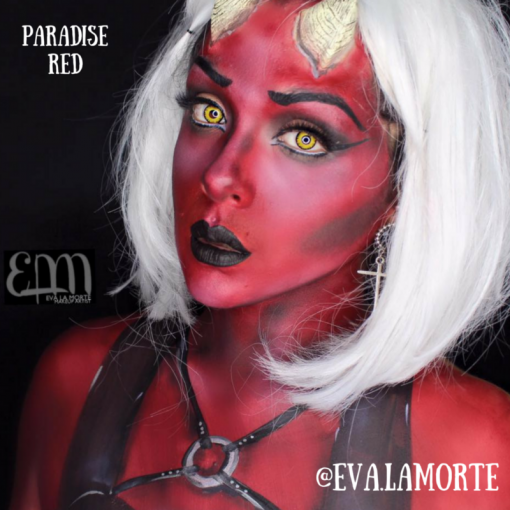 Paradise Paints- made by Mehron, approved by Jinny, and a world wide favorite offers 2 different Reds. One is called Beach Berry and it is a bright reddish orangish color. 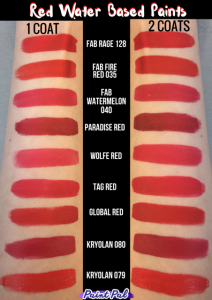 For those looking for a bright red, with an orange undertone the Beach Berry and FAB rage are good choices. Paradise Red looks brown in the container at first glance, but once you activate it with water it becomes a deep red, a blood red and good for those that want a less orangish red. If you are looking for a more pinkish red the FAB Watermelon is a good color that is close enough to red without the overpowering punch that red sometimes has. So when you are trying to decide which paints to include in your kit, take my advice and choose color of name brand. I am working hard on color swatches and will have them all done by Monday. In the meantime, if you are a cosplayer and want to color match, or are looking for the perfect shade of Green to paint Packer fans we can help! As always the staff at Silly Farm are here to be your paint pal. Stay tuned for more color swatches and some new brush tutorials on the way! A Face Painter’s Treasure Box- what’s in your kit? Creating Your Brand-able Factor.. Are you Target or Walmart? Thank you for this post. It’s very helpful. I do have a question. 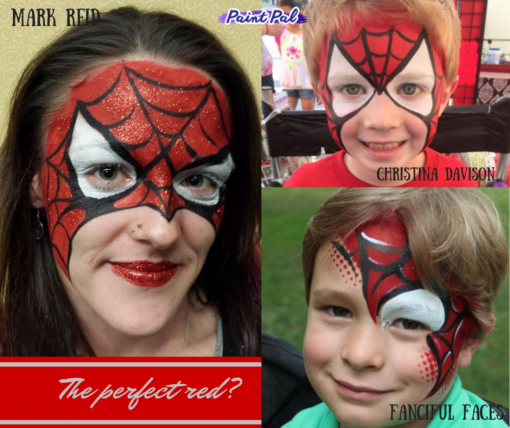 Do you by chance know what red is used in the spidey eye photo from Fanciful Faces. 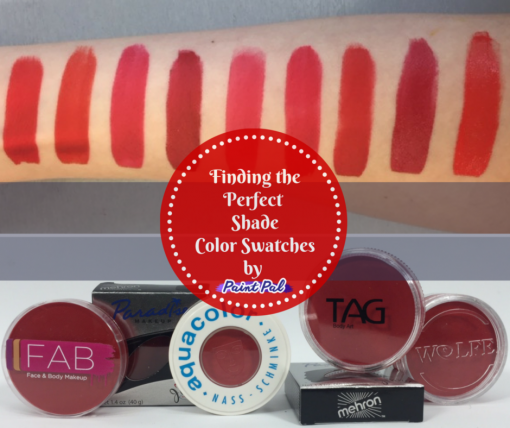 It’s just the shade of red I’m looking for and I’m not sure which it might be from your swatch chart.